If you think that asbestos exposure is something that only happened to people in the past, think again. While many mesothelioma victims were exposed to asbestos working in boiler rooms or on factory lines with components that contained asbestos, work is not the only place where asbestos exposure happens. Some women who never did factory work have developed mesothelioma, a rare cancer caused by asbestos exposure. They came into contact with the toxic fiber through dust carried home on a husband’s work clothes. That kind of secondary exposure risk is still all around us, because asbestos remains in our built environment. Remodeling projects are a time to be extra aware of the dangers of asbestos exposure. Insulation, drywall, roofing materials, tile, cement, siding, duct, plaster, caulk, acoustical tile, and vinyl floor coverings: this is just a partial list of the building materials that may contain asbestos. Even some of the glues used in home construction can include asbestos. If your home was built or remodeled between about 1940 and 1975, there is a good chance that your house contains some asbestos building materials. The fiber is most likely to be found in insulation around the boiler and surrounding pipes in your basement, but may be anywhere up to the attic insulation and even the shingles on your roof. Newer construction carries much less risk of asbestos exposure, but modern materials aren’t necessarily asbestos-free. Components such as roofing, insulation, and vinyl tiles may contain as much as 1% asbestos. The good news is that, if you leave these building components in place, there is little danger of asbestos exposure. When you remodel, however, it’s a different story. 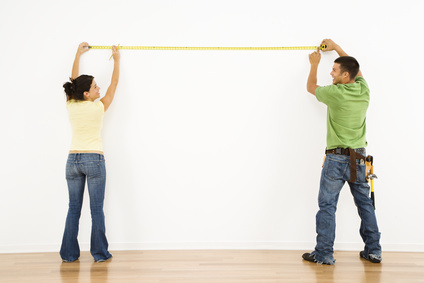 Do-it-yourself or DIY home improvement can be a great money saver. Plus, you have the satisfaction of looking every day at something you built with your own hands. But DIY projects can also lead to asbestos exposure, if you’re not careful. One of the challenging aspects of asbestos exposure is that the harmful effects usually don’t show up until many years later. You may think it’s fine to take out a wall in your living room because you already replaced the drywall in the dining room and you didn’t feel sick at all. If you felt well at the time and you still feel fine, that doesn’t mean that you weren’t exposed to asbestos during a remodeling project. The symptoms of mesothelioma and lung cancer caused by asbestos take many years and sometimes even several decades to show up. Don’t judge the safety of your home remodeling project by how you feel. Take precautions instead. When you take on a home remodeling project, don’t let your enthusiasm get ahead of your common sense. Here are some don’t that will save you and your family from asbestos exposure. Don’t do any demolition before you have examined the area to see if there might be any asbestos. You could be release a cloud of asbestos fibers when you knock down that wall. When in doubt, call in an asbestos inspector to check it out. Don’t try to remove asbestos yourself. Your greatest danger of asbestos exposure is when old building materials are disturbed. A professional will take precautions to prevent asbestos exposure during remediation. Don’t use tools that stir up dust in areas that may contain asbestos. Sanding, drilling, and sawing can lead to asbestos exposure. Even dusting or sweeping increases your chances of inhaling airborne asbestos. Don’t walk around in dusty work clothes or boots, if you suspect you have been working around asbestos. You may be tracking asbestos exposure through your house along with those boot prints. Remove clothes that may contain asbestos and wet them down to keep the fibers from getting into the air. Then put your clothing in an air-tight container and have it cleaned or disposed of by asbestos professionals. Don’t try to wash them yourself. If home remodeling sounds scary to you right now, don’t worry. There are some simple steps you can take to reduce your risk of asbestos exposure during your DIY projects. Before you replace your kitchen cabinets or build a spare room in the basement, educate yourself about where asbestos materials might be found in your home and learn how to recognize them. One telltale sign: vinyl floor tiles that are nine inch squares. This size of tile was commonly made with asbestos. Even if the tiles have been removed, if you can see the outline of tiles this size, there may be remnants of asbestos lurking in your floorboards. Don’t work on the area until you have checked the potential for asbestos exposure. If you come across anything you suspect of containing asbestos, don’t touch it: this could be a dangerous source of asbestos exposure. Now is the time to call a professional to inspect your home and find out if there is asbestos, where it can be found, and whether it needs to be removed or should be left in place. It’s worth spending the money to hire a trained professional before you start your DIY home improvement project, if you think your home may contain asbestos. Otherwise, your renovation project could lead to asbestos exposure for your family. Your first step is to find out whether there is asbestos in your home and where it can be found. While there are many DIY kits on the market to test for possible sources of asbestos exposure, these may not be reliable. In addition, conducting the test yourself could lead to asbestos exposure while you collect samples. There are two types of asbestos professionals: those who inspect and test for the presence of asbestos and those who do remediation to remove it safely from your home. The EPA recommends hiring a firm to test for asbestos exposure that does not also do remediation work, so they won’t have an incentive to recommend unneeded work. Make sure you hire asbestos abatement contractors who have been trained in proper remediation procedures, so asbestos removal doesn’t lead to more asbestos exposure. Even if you’re not doing a remodeling project, the danger of asbestos exposure may be lurking in your home. If your home contains building material that could contain asbestos, keep an eye on it. If you notice any of the materials becoming brittle or crumbling or flaking, call professionals to test for asbestos and, if necessary, safely remove the materials. Your safety is worth the cost of asbestos abatement. After all, your life could depend on it.